The BUENOS AIRES, with its minimalist design and natural touch of Acacia wood, is resolutely modern and chic. It can accommodate easily 5 people in a really comfortable way. The Buenos Aires has 2 lateral table which are perfect to put your glass of wine or beer after a long day at work, or your books. It also comes with a coffee table which is really practical and classy at the same time. 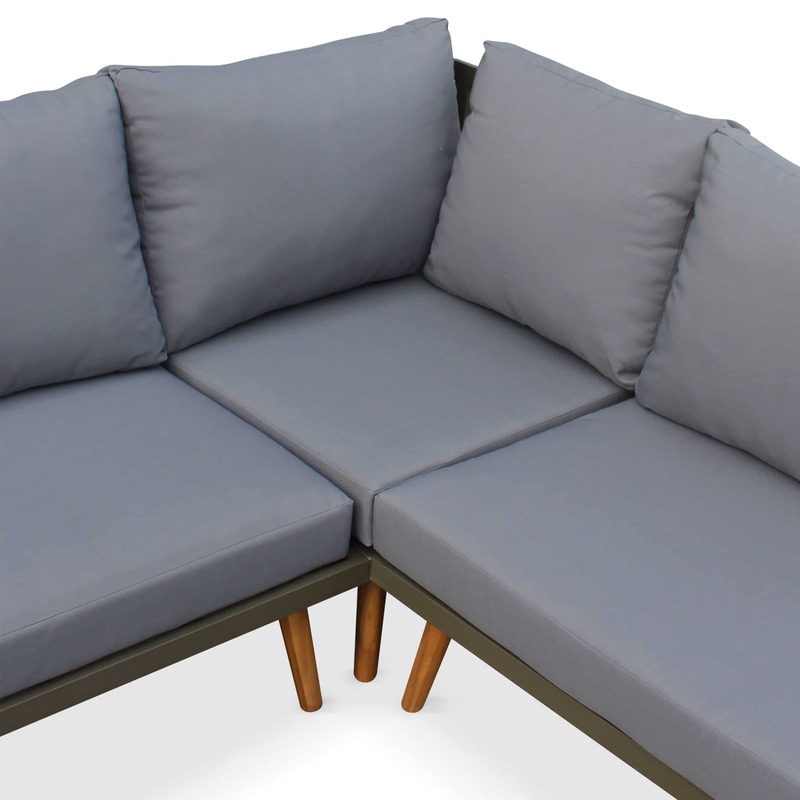 The Buenos Aires Outdoor Lounge is a customer favourite at Alice’s Garden. Its beautiful Scandinavian design and sleek edges are just a few of the features that really makes it standing out from the rest. The use of Acacia and Aluminium allows for a modern look with a natural touch, all whilst maintaining a sense of elegance and class. It’s no secret why we like to describe the Buenos Aires as simply stunning. The Buenos Aires doesn’t just look spectacular, its 12cm thick padded cushions make it extremely comfortable. Some of our customers have likened the softness of these cushions to what you would expect to find on an indoor sofa. Finding a good quality lounge that also withstands the elements can be a tough ask. The Acacia wood has been deliberately chosen by Alice’s Garden as we believe that it is an excellent choice to resist the sun’s rays. As for the frame, the reinforced aluminium has been carefully chosen to ensure longevity. Did we mention that the cushions come with removable covers that are water resistant? This outdoor lounge is not only practical, it’s also versatile . 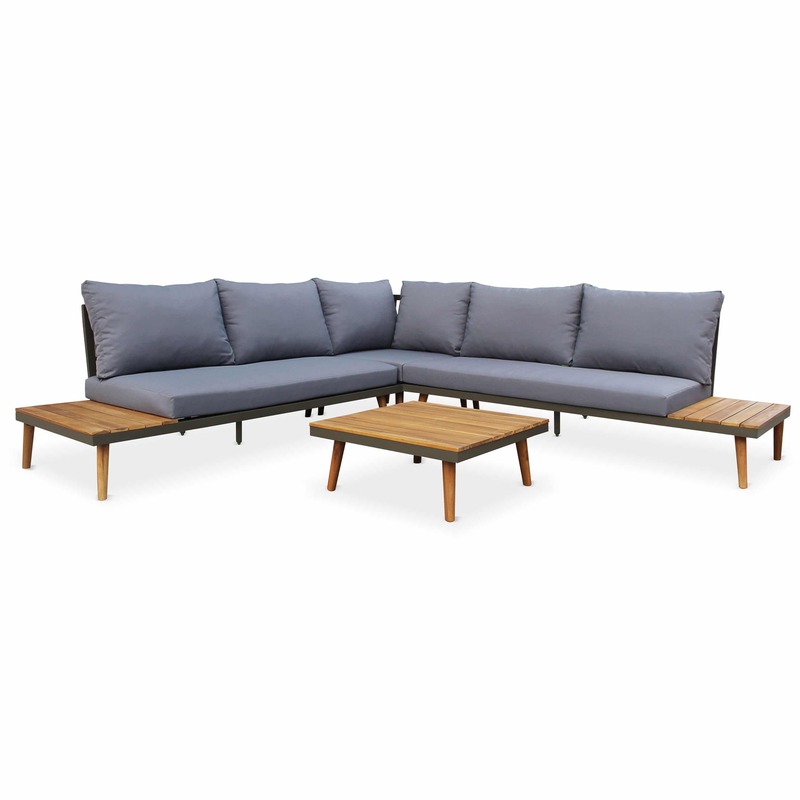 The Buenos Aires Outdoor Lounge is coated in a colourless oil during manufacturing. In some limited circumstances this may result in a slight residue. In this instance, simply remove it with a cloth before using it. Please note that you do not need to put oil on your Outdoor Lounge before the end of its first summer. Although the Outdoor Lounge is sturdy and weather resistant, acacia is a living material and its appearance may change over time and some fractures may appear. Therefore it requires some maintenance to prolong its life. We recommend to apply oil twice a year to restore the original acacia colour and to protect from stains and reinforce its weather resistance. You can also reduce wear and tears by removing leaves, stagnant water and dust every day. We advise you to clean stains with soapy water and a sponge or use a small hard brush if the frame is dirty. After a few rainy days, the surface fibres may slightly swollen and get rougher to the touch. In this instance, simply sand lightly with fine-grained sandpaper until smooth. Once woodwork is completely dry, apply a thin layer of oil to restore protection (ensure it does not rain for the next 24 hours). 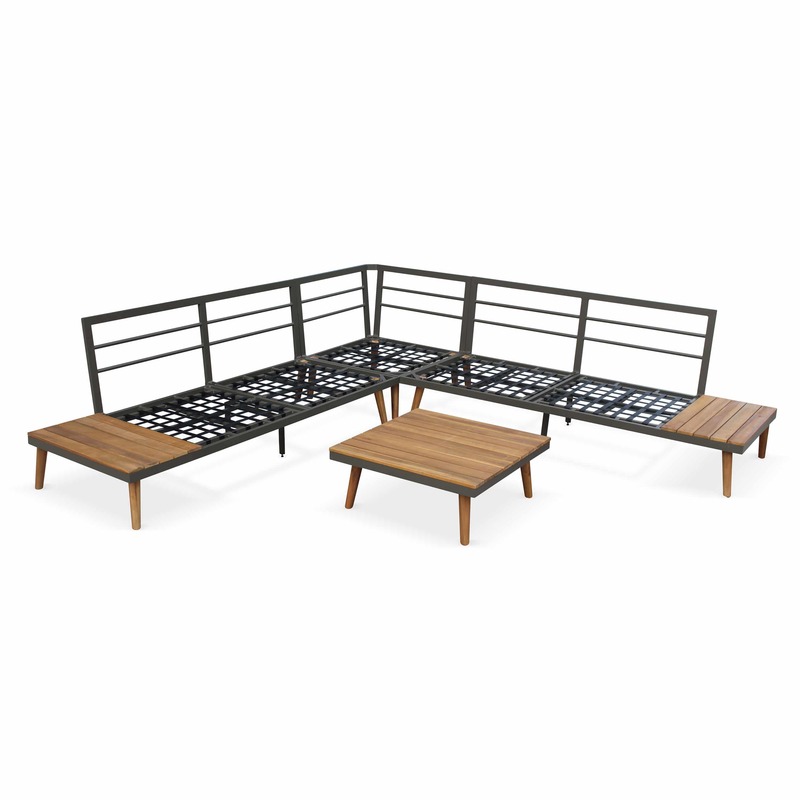 It is important to prepare your acacia garden furniture for winter. Thus we recommend to keep it away from moisture and prefer a cool, ventilated place. You can protect it with a cover, but choose a polyester one over a PVC one. Do not expose your Outdoor Lounge to direct or excessive heat. Please protect your outdoor lounge carefully from rain and salt water. PLEASE NOTE: The colour of the product on the photo may vary depending on your screen’s settings. Please protect your outdoor lounge carefully from rain and salt water. If you would like to check out our entire range of Outdoor Lounges, please click here! We understand that your entertaining area is made up of many different components to make it truly yours. That is why we have a range of products on offer that perfectly complement the Buenos Aires. Take the Sevilla Dining Set for example – an extendable outdoor dining set that has been crafted with a stunning acacia wood. The similar look between the two products really make them a great match – not to mention that the Sevilla also utilises an aluminium frame for maximum longevity. It also boasts absolute comfort and practicality as one of our best-selling dining sets. You can find the Sevilla in our range of Dining Sets & Chairs and all of our other Outdoor Lounges here.